Speak Schmeak: Do your audience's filters override your message? It's a story about a fig. It's a very simple story. This fig is HUGE. 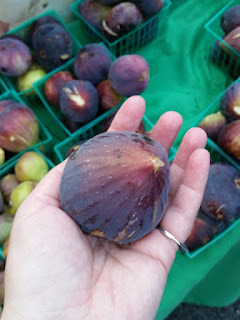 I posted this picture on Facebook of the fig filling the palm of my hand. I thought the fig would speak for itself. But I was wrong. I started getting comments like, "Can't get them here!" and "My mom loved figs, she had a fig tree." Someone said, "I used to love figs, still love fig Newtons cookies. My grandmother had a fig tree." And "Yum!!! Really miss that wonderful Cali produce!!!!" And not one person mentioned the size of the fig. Okay, if I had known this was going to turn out to be such an interesting experiment, I wouldn't have captioned the picture "Anyone want a fig?" I would have left it blank. But I didn't know it was going to be such a great experiment - and a perfect analogy for public speaking. Here's the thing: Your audience is ALWAYS going to interpret your stories and your message through their own filters, their own background, and their own lifetime of knowledge and experience. When I see a meatloaf, I can't help but think about the meatloaves my mom used to make (with whole hard-boiled eggs inside! ), and when someone sees a fig, they can't help but think of their relationship to figs. If my message is clear - "Can you believe the size of this fig?" - then I'm more likely to get responses to the size of the fig. People will still filter the picture and the message through their own experiences, but they will also understand that my message is "Hey, this fig is huge!" And then their responses will be more like "I've never seen a fig that big," or "Is that closer to an apple or a peach in size?" Even those whose filters bring up grandma's fig tree might say, "My grandma had a fig tree, but I never saw one this big." The responses will now be in the same context as my message was intended. But if my message is NOT clear, then they will come up with their own messages and stories about the fig, and those messages and stories will have nothing to do with what I intended. This is what happens in your presentations when you're not crystal clear on your core message, your key points, how your examples and stories tie into your message, what's relevant to your audience, and what results you're hoping to achieve. Your audience is already interpreting your message through their multiple filters. Being vague and scattered only makes it easier for them to get lost in their own heads rather than taking away the message you intend for them. Now how about the size of that fig?